We’d love your help. Let us know what’s wrong with this preview of Fleet of Knives by Gareth L. Powell. From award-winning author Gareth L. Powell comes the second book in the critically acclaimed Embers of War space opera series. The former warship Trouble Dog and her crew of misfits is called upon by the House of Reclamation to investigate a distress call from the human starship the Lucy's Ghost. Her crew abandon their crippled ship and seek refuge aboard an abandoned, slow From award-winning author Gareth L. Powell comes the second book in the critically acclaimed Embers of War space opera series. The former warship Trouble Dog and her crew of misfits is called upon by the House of Reclamation to investigate a distress call from the human starship the Lucy's Ghost. Her crew abandon their crippled ship and seek refuge aboard an abandoned, slower-than-light generation ship launched ten thousand years before by an alien race. However, the enormous ship contains deadly secrets of its own. Recovered war criminal Ona Sudak faces a firing squad for her actions in the Archipelago War. But, at the last moment, she is smuggled out of her high-security prison. The Marble Armada has called for her to accompany its ships as observer and liaison as it spreads itself across the human Generality, enforcing the peace at all costs. The alien ships will not tolerate resistance, and all dissenters are met with overwhelming and implacable force. Then her vessel intercepts messages from the House of Reclamation and decides the Trouble Dog has a capacity for violence which cannot be allowed to endure. To ask other readers questions about Fleet of Knives, please sign up. Why isn't there even a year posted for this book to come out? I'm a bit torn on this one. On the one hand, I do like the story and the general premise. I like the idea of the sentient Trouble Dog and her whole internal conflict and rebuilding of her sense of place, but I also felt there wasn't quite enough of that here. On the upside, in Fleet of Knives the character that I felt was a bit too much of a sideline in Embers of War, Ona Sudak, reveals her importance to the overall story arc. On the other hand, I continue to struggle a bit with the writing, which I actually thought was good, but maybe just not exactly to my taste. All the POVs are written in the first person, and with the exception of Nod and Trouble Dog the voices are not particularly distinct. A couple of times I had to go back and check the chapter heading to see if it was Sal, Ona, or Johnny who was speaking. The chapters are also extremely short, which is great for short reading bursts, but not so good for extended reading. That structure made me feel like I was changing gears too frequently and kept losing momentum just as things were getting interesting. All of that said though, I think the story is very good, and similar to the first book, Fleet of Knives really picks up towards the end. Unfortunately it also sort of leaves things hanging at the end, so it feels very much like a middle book. I loved Embers of War but Fleet of Knives is even better! It's such an exciting, very well-written read, packed full of spaceships, aliens, battles, mysteries and menace. Arguably the stars here are the spaceships themselves and each has its own distinct character. Loved it. Review to follow shortly on For Winter Nights. The story moved quickly, and switched from character to character each chapter, like book one. Sal’s still wracked by guilt by George’s death in book one, and she and Trouble Dog are still processing their past actions, which makes for some interesting ethical conversations they have together and with others. Fleet of Knives is the sequel to last year's Embers of War and follows on from roughly where the last one left off. A year has passed and following a debriefing and some repairs Trouble Dog and her crew are off on a shakedown cruise, ostensibly to make sure everything's running smoothly but also to give the crew a chance to patch up any psychological wounds they might still be suffering, when they're called on to rescue some merchants Yet another fantastic outing for the Trouble Dog and her crew. Fleet of Knives is the sequel to last year's Embers of War and follows on from roughly where the last one left off. A year has passed and following a debriefing and some repairs Trouble Dog and her crew are off on a shakedown cruise, ostensibly to make sure everything's running smoothly but also to give the crew a chance to patch up any psychological wounds they might still be suffering, when they're called on to rescue some merchants stuck on a derelict generation ship. Meanwhile, the former Butcher of Pelepatarn, Ona Sudak, is facing death by firing squad for her past crimes only to find herself being whisked away to act as the biological controller of the titular fleet of knives, the Marble Armada. What follows is another fun and frenetic slice of space opera from Gareth L. Powell. The stranded merchant crew are forced to face off against a slew of overgrown, psychotic metal crayfish while they wait for rescue. Meanwhile the Trouble Dog has to fight off the alien fleet who having been given the task of ensuring there are no more wars as terrible as the last one have determined that the best way to do this is to simply get rid of all weapons of war. There's a lot of well-written character building going on in this novel, but where Powell's writing really shines is in the action. Whether it's a last-stand shootout between the merchants and the giant crawdads or an exchange of torpedoes between Trouble Dog and the Marble Armada the action rolls by at an exhilarating pace. There are casualties, and those casualties are hammered home in the reactions of the respective crews represented. I compared the first book to Iain M. Banks and in this second book I really do think that comparison still holds true. The Trouble Dog and Sal Konstanz are back after the events of Embers of War, and specifically after a refit and rearm of Trouble Dog, they're off on another rescue. This time it's the stranded crew of opportunistic raiders who'd tried to loot an ancient and immense generation ship that an alien race had been preserving as a monument. All this while the Fleet of Knives gain a new commander, the previously introduced Ona Sudak, and a mission throughout human space that leads them on a collision co The Trouble Dog and Sal Konstanz are back after the events of Embers of War, and specifically after a refit and rearm of Trouble Dog, they're off on another rescue. This time it's the stranded crew of opportunistic raiders who'd tried to loot an ancient and immense generation ship that an alien race had been preserving as a monument. All this while the Fleet of Knives gain a new commander, the previously introduced Ona Sudak, and a mission throughout human space that leads them on a collision course with the House of Reclamation. 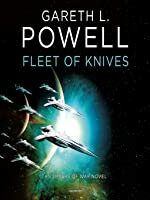 Gareth L. Powell's Fleet of Knives is without any kind of doubt one of the best and most enjoyable space opera novels I've ever read. I haven't read anything as entertaining and rewarding as this novel since reading Iain M. Banks and Neal Asher. Considering the huge amount of space opera novels being published each year, it's amazing to find a novel as fresh, rich and enthralling as Fleet of Knives. It has all the elements one could ever hope to find in epic Originally published at Risingshadow. Fleet of Knives is everything Embers of War is and more. As Titan Books send me both book one and two, I was able to read these back to back. That felt so good. I was submerged in this whole futuristic world for about a week and being able to start the sequel right away contributed to my reading experience in a very positive way. While book one was all about the discovery of the Marble Armada, or the Fleet of Knives as some called it, book two was about exploring how they would fit into the world (and how these million ancient ships obviously don't). About six months passed since the events of Embers of War and it begins very smoothly and shows the (mental) aftermath of everything that happened. It's an amazing transition, especially if it has been a while since you read the previous book. I really appreciate this, as some sequels/next books in a series I read recently start relatively rough and it takes a while until it really feels conncected to what happened before. It is a shame this happens, which is why I am extra glad Powell did it very well for this trilogy. Fleet of Knives has both familiar faces as new ones. Trouble Dog's crew went on a hiatus after everything that happened in book one, but still remains ever vigilant when another crew is in need of help. The crew of Lucy's Ghost is equally unique as the Trouble Dog's and written amazingly, I was invested in them from the start. I very much enjoyed these new characters and how they handled certain situations and how to interact among eachother. I very much hope to see more of them in book three. Powell's writing is very immersive and realistic, something that just takes hold of you and doesn't let you go, even when you are done with the very last page. It is impressive and I very much love it. In my honest opinion, Fleet of Knives is just like the first book a solid five-star sci-fi book. It has a strong female lead, an amazing story and a perfect amount of space ships and other science fiction-y scenes. I can go on with my praise, but I think you should just read my review of Embers of War as practically everthing I said goes for Fleet of Knives aswell! I would really recommend all fans of a good science fiction novel to read this series. The last book in this trilogy, Light of Impossible Stars, will be out in February 2020 and this next year can't go fast enough. I need to know how this ends. At this point, this is one of my favourite series I have read in the past year. 2/19/19 Oh, man, Book 3 cannot come fast enough! I readily admit that I don't remember a whole lot from the first book, which was an intriguing novel of ideas that somehow lacked an ability to engage me emotionally. Fleet Of Knives certainly doesn't suffer from that problem! We open with Captain Sal Konstanz on a pilgrimage of sorts, with her ship Trouble Dog on overwatch. Sal is trying to patch things up with security officer Alva Clay after the events of the last novel, a 2/10/19 Full review tk. I readily admit that I don't remember a whole lot from the first book, which was an intriguing novel of ideas that somehow lacked an ability to engage me emotionally. Fleet Of Knives certainly doesn't suffer from that problem! We open with Captain Sal Konstanz on a pilgrimage of sorts, with her ship Trouble Dog on overwatch. Sal is trying to patch things up with security officer Alva Clay after the events of the last novel, and the two women reach a sort of tentative peace even as they become aware of the suspicions that the rest of humanity hold against the Marble Armada, as the unmanned fleet that Sal, Alva and Trouble Dog discovered is now known. They soon have more immediate things to worry about, however, when their bosses at the House Of Reclamation send them to the edge of alien Nymtoq territory in response to a distress call from human starship Lucy's Ghost. Lucy's Ghost is captained by Lucky Johnny Schultz, a rogue trader pushed to the limits of legality to pay his crew. To this end, he's decided to have them raid an abandoned, if still venerated, Nymtoq generation ship, but finds that their passage through hyperspace has brought along unwelcome visitors. Elsewhere in the known universe, former poet Ona Sudak has been found guilty of war crimes, and is set to face execution. But the Marble Armada has plans that will set her on a collision course with Trouble Dog, even as she plots to save the Human Generality from itself. This book was such a ride, switching quickly and smoothly between points of view to present a really terrific space opera. The personalities of all involved felt so alive, even as everyone worked towards their different ends. Gareth Powell plots deftly, and writes with an eye for both action and humor. When I hit the last page, I nearly jumped out of my seat with outrage: I want to know what happens next, and now! That said, it's a good ending -- I hate when books feel incomplete and this one certainly doesn't. I'm just impatient for the rest of the story! FoK also contains the best two-word chapter I've ever had the privilege of reading. I hate to be the voice of dissent here—but Fleet of Knives suffers from several, hardly insubstantial flaws. The most serious one is Gareth Powell’s style of writing. Exactly like in the prequel and in his award-winning Ack-Ack Macaque, he uses different POVs to weave several plot threads into a climax at the end of the novel. The problem is that all POVs here sound the same: like solemn declarations of someone very prim, conscientious and politically correct (and therefore not particularly plau I hate to be the voice of dissent here—but Fleet of Knives suffers from several, hardly insubstantial flaws. The most serious one is Gareth Powell’s style of writing. Exactly like in the prequel and in his award-winning Ack-Ack Macaque, he uses different POVs to weave several plot threads into a climax at the end of the novel. The problem is that all POVs here sound the same: like solemn declarations of someone very prim, conscientious and politically correct (and therefore not particularly plausible). The first person narrative hardly helps: not only does it make it difficult to differentiate between different plot strands, but it also ruins any attempt at characterisation. It is also that many times that you can use the same approach and structure (i.e. seemingly unrelated plot threads converging into a conclusion) without getting clichéd, and three times in three books is three times too many. Combined with the usual problems for any middle novel in a trilogy and the general lack of ‘oomph’ in all of Powell’s books (both Embers of War and Ack-Ack Macaque were pleasant and well-written, but hardly innovative or emotionally engaging), this makes an otherwise decent novel surprisingly dull and lacklustre. Overall, Fleet of Knives ends up amplifying all the problems of its prequel without having any its originality. Oh, Trouble Dog, where are thou? I like the idea of sentient ships, one where their own moral code can be challenged. That is what we learned in the first book, why Trouble Dog works for the House of Reclamation. As Trouble Dog points out in this book, all humans are broken in some way. It is a matter of how humans compensate in groups for their flaws, building a more solid whole. For me, this a profound observation of a former ship of war. I take the premise of this book to be: Careful what you Oh, Trouble Dog, where are thou? I take the premise of this book to be: Careful what you wish for. The Fleet of Knives embodies this. They are a million strong fleet of sentient ships, operating as a kind of hive mind. They have purpose, but how they interpret their seemingly simple instructions is not what the humans expected. There is a lot of thought put here, as it has had me thinking about it for a few days after finishing. This is a good thing. The book is a fast read, with the same shifting first person narrative style of the first book. New characters are introduced, old characters explored further. Nod still rocks, though it felt there was less time devoted to him this time around. The author continues to surprise, each of which felt correct & not simply tossed in. The book really sets up the third in the series. I really like what the author is doing and look forward to where he takes us next. 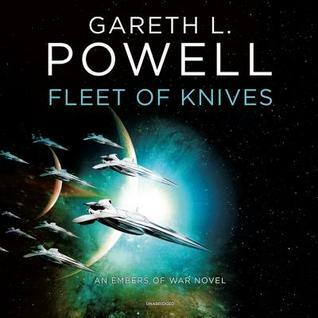 Fleet of Knives is the second novel in the Embers of War series by Gareth Powell. It follows three main storylines – one with ex-warship Trouble Dog and its crew, who are sent to investigate a team that are in trouble and marooned in a barren ship, which is the second. In the third, war criminal Ona Sudak is saved from execution at the last minute to be the representative for the Marble Armada, tasked with enforcing peace at all costs. Like the first book, Fleet of Knives works at a brisk pace, s Fleet of Knives is the second novel in the Embers of War series by Gareth Powell. It follows three main storylines – one with ex-warship Trouble Dog and its crew, who are sent to investigate a team that are in trouble and marooned in a barren ship, which is the second. In the third, war criminal Ona Sudak is saved from execution at the last minute to be the representative for the Marble Armada, tasked with enforcing peace at all costs. Like the first book, Fleet of Knives works at a brisk pace, setting up the characters and plot early, then gradually joining the three groups together for a confrontation at the conclusion. This continues the "What do you do when you've done the worst thing possible" choice path. Look. I'm not judging the Author here, I think there's actually legitimate reasons for the (view spoiler)[absolutely mind-numbing insanity of the fleet of knives, though the "poet" doesn't get the same excuse. Go back to your firing squad, you deserve it more than ever. (hide spoiler)] But it did make it much, much harder to get into this book. The main job of the crew, the space rescue work, gets them int This continues the "What do you do when you've done the worst thing possible" choice path. Trouble Dog is back with her crew in mourning and on cruise shakedown. Then comes the call from the House of Reclamation a ship is in distress on the border of Generality space with the Nymtoq. At Camrose the alien fleet a million strong awaits a human commander so they can fulfill their purpose to end war. Who better than the commander in humanity's last war whose actions culled a billion sentient trees. Who else can make those hard decisions? Mr Powell has given us more Trouble than we could hope for and yet again it will be the Dog that might just save us all. I have been eagerly awaiting this and I now have the joy of anticipating the close of this trilogy hopefully next year. I've read several books lately where I really disliked one or more characters, but Ona Sudak is probably my most-despised character in recent memory. Which makes it truly unfortunate that she's the driving force behind the entire plot arc here. Don't get me wrong - this is still fine space opera and I'm very much looking forward to the next novel in the series. But beyond that, I'm driven to continue this series just in hopes that she dies a very slow and painful death. There are definitely some I've read several books lately where I really disliked one or more characters, but Ona Sudak is probably my most-despised character in recent memory. Which makes it truly unfortunate that she's the driving force behind the entire plot arc here. Don't get me wrong - this is still fine space opera and I'm very much looking forward to the next novel in the series. But beyond that, I'm driven to continue this series just in hopes that she dies a very slow and painful death. In my first review I said, "A delightful cocktail of Science Fiction that includes: war, sentient ships, ancient archeology, empires, various races, hyperspace, guilt, redemption and hard questions." Well for this book he adds inter dimensional monsters and ghost ships to the series. My biggest complaint with the first book was the beginning, but I found this book to be much easier to get into. However, while I know this is the second book in a trilogy, I was expecting a little more from the endi In my first review I said, "A delightful cocktail of Science Fiction that includes: war, sentient ships, ancient archeology, empires, various races, hyperspace, guilt, redemption and hard questions." Well for this book he adds inter dimensional monsters and ghost ships to the series. Poor Trouble Dog (remember she is a warship that did not like what she had done and changed sides) Even a routine shape up flight after repairs turns into trouble. And not just trouble for her - trouble also for the ship they try to rescue. This changed view points throughout the book as danger from multiple fronts are revealed. There are new characters introduced and the crew of the Trouble Dog returns. Nod is still my favorite character and there is a big surprise when the ship goes off on the Poor Trouble Dog (remember she is a warship that did not like what she had done and changed sides) Even a routine shape up flight after repairs turns into trouble. And not just trouble for her - trouble also for the ship they try to rescue. This changed view points throughout the book as danger from multiple fronts are revealed. There are new characters introduced and the crew of the Trouble Dog returns. Nod is still my favorite character and there is a big surprise when the ship goes off on the rescue mission. This set the stage for the next book and while the Trouble Dog is in constant danger much of that danger remains. The return of Trouble Dog, a warship with certain opinions. When last we left,Trouble Dog had recruited a million strong fleet of ships that were sworn to protect life. Now the fleet has recruited their own commander who also has sworn to prevent whole scale war. Unfortunately, when dealing with a rather literal crowd, allowing them to use "all means necessary" to achieve their goal is only going to end up in one place. While Trouble Dog is on a rescue mission things go from bad to straight out b The return of Trouble Dog, a warship with certain opinions. Powell builds a full universe full of governments, armies, politics, alien cultures, FTL technology and alternate dimensions, exotic planets... and admits all that he has a tremendous knack of focusing on a small cast of engaging characters. For whatever reason, I’ve enjoyed Powell’s non-human characters even more than his human ones. The sentient spaceship Trouble Dog is fantastic! But who really surprised me was the disgruntled alien ship engineer Nod. Nod really shines in the second book of th Powell builds a full universe full of governments, armies, politics, alien cultures, FTL technology and alternate dimensions, exotic planets... and admits all that he has a tremendous knack of focusing on a small cast of engaging characters. For whatever reason, I’ve enjoyed Powell’s non-human characters even more than his human ones. The sentient spaceship Trouble Dog is fantastic! But who really surprised me was the disgruntled alien ship engineer Nod. Nod really shines in the second book of the series! Brilliant book. Very well written, great and unexpected plot. Great characters. Written as a great story that just happens to be set in a world that demands sci-fi, as opposed to "let's find a story that uses spaceships and laser guns". The text is often deep and moving, and certainly thought provoking. Very much recommended. Nice. Really nice. As I suspected from the first book, the author has really grown into his setting. This fair rollicked along. It had adventure, laughs, pathos and that indefinable 'I am enjoying this' quality. Straight up, old school space opera. So, nothing ground breaking here. You know what though? Not everything needs to break new ground. A good story, well told. One doesn't ask for more. Oh my word yes! Such a worthy successor to Embers of War. I feel like with every novel Gareth L Powell is levelling up as an author and I can't wait to see what he does in the final part of this trilogy. Most of the things I want to gush about would also involve spoilers - not uncommon once I'm deeper into a series. So... if you like science fiction, if you like characters that feel completely real - flaws and all... do yourself a favour and read this. MARCIA-DON'T READ THIS! oh man. i don't know how to rate this one. i liked it less than the first but it was still a decent fast read. am i jumping to read the next after this? not really. if i'm honest, i became a bit bored and uncaring of the outcome in this one. does appear the universe/galaxy is in real difficulty the Fleet is not always what you want? and things lurking in the other dimensions could be trouble? The series continues. All humankind are now under attack by vastly superior forces who are wiping all war making capabilities to produce peace, war makes peace. Our ragged band of heroes are racing away to hopefully find the time and resources to fight back. Fun Sci!! Gareth L. Powell is an award-winning author from the UK. His alternate history thriller, Ack-Ack Macaque won the 2013 BSFA Award for Best Novel, spawned two sequels, and was shortlisted in the Best Translated Novel category for the 2016 Seiun Awards in Japan. His short fiction has appeared in a host of magazines and anthologies, including Interzone, Solaris Rising 3, and The Year’s Best Science Fi Gareth L. Powell is an award-winning author from the UK. His alternate history thriller, Ack-Ack Macaque won the 2013 BSFA Award for Best Novel, spawned two sequels, and was shortlisted in the Best Translated Novel category for the 2016 Seiun Awards in Japan. His short fiction has appeared in a host of magazines and anthologies, including Interzone, Solaris Rising 3, and The Year’s Best Science Fiction, and his story ‘Ride The Blue Horse’ made the shortlist for the 2015 BSFA Award.